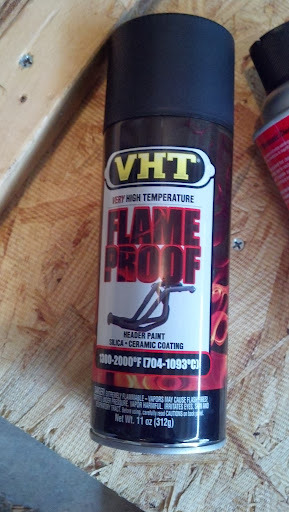 got me a can of this, will report how well it works. the oven at work right now won't reach the 600F for the 3rd cycle... gotta be creative. I will definitely be shipping mine to you, most likely early next year! Can't wait to ride with them next Spring! P.S. I forget if you answered this or not, but did the tuneboy deal with any of the rideability issues at lower speed, or the jumpy throttle at lower speeds? I read your article with great interest. Lots of guys are changing to termi's here in europe so there are a lot of standard cans available. Time for some experimenting. I'll do it myself because the shipping to and from the states is outrages. Questions. Did you also consider making a removable db killer instead of the mess frame? Over here we have big issues when riding on the race tracks with to much "noise" and no db killers. What is the use of the mess frame? Is it purely for the looks? Do you have a picture of the muffler with the cat? I recon that removing the cat is more than sufficient to get the gasses flowing or would it be interesting of making more passage to the rear? By the way has anyone seen the interior design of the termi or akrapovic muffler? Finally I still have 2 PCV's lying around so I'll do a full tuning after the modification. Done this a few times before and just tunes the mod to it's maximum potential. Last edited by HqRacing; Dec 28th 2013 at 07:21 AM. I read your article with great interest. Lots of guys are changing to termi's here in europe so there are a lot of standard cans available. Time for some experimenting. That's the spirit!!! Questions. Did you also consider making a removable db killer instead of the mess frame? no, but that's a good idea. I rather thought of utilizing the flapper valve for partial noise reduction... Over here we have big issues when riding on the race tracks with to much "noise" and no db killers. i know. that's why i moved here What is the use of the mess frame? Is it purely for the looks? yes. I recon that removing the cat is more than sufficient to get the gasses flowing or would it be interesting of making more passage to the rear? that's what's included in my mod. First modded exhaust is already in Arkansas, second one going to be handed over in person to fellow member weltonrk. So far quite some interest, though i am not sure if i will continue doing this. It's a dirty, hard job and pays less than my day-job. I have 4 mesh covers left, so 2 more exhaust will be modded. For another batch i will need 5 orders lined up.